I'm going to start off by saying I have never made Mexican food from home before besides the occasional out-of-the-box taco dinner, so I was worried this was going to turn out horribly. Luckily, I was wrong -- it was delicious! I didn't follow the recipe exactly because I couldn't find enchilada sauce at the grocery store (why do I always have this problem?) and I had to end up buying packaged enchilada mix and using it that way. I would still recommend trying it exactly as the recipe details it because I think it would give it a much more authentic and fresh taste. My friend found this recipe on A Sweet Pea Chef and sent it to me to try because it was easy and didn't use a lot of dishes - both things I love to hear. I highly recommend this recipe for an easy weekday dinner with the whole family. It is cheesy, meaty and very filling ... and the leftovers reheat superbly! Add the minced garlic to the enchilada sauce in a deep skillet and heat to boiling. Generously sprinkle kosher salt and ground black pepper over the chicken breasts and then nestle the chicken breasts into the sauce. Reduce the heat to low, cover and cook until the chicken is cooked through, about 15-20 minutes. Remove the chicken from the sauce, set aside and let both the chicken and the sauce cool. Transfer the shredded chicken to a large bowl. Add half the enchilada sauce, 1/2 cup each of the Monterrey jack and cheddar cheeses and the 1/2 cup of cilantro to the shredded chicken. Stir to combine. Wrap the corn tortillas in a damp cloth or paper towel and microwave on high for 20-30 seconds until pliable and warm. Using cooking spray (if desired), oil a 9-inch x 13-inch baking dish. Spoon about 1/3 cup of the chicken mixture along the center of the tortilla. Gently, but firmly, roll the tortilla around the filling and place into the baking dish, seam-side down. Repeat with remaining tortillas. Place baking dish in the oven, uncovered, for 8-10 minutes or until the tortillas begin to turn golden. Reduce the oven temperature to 400 degrees. Remove the baking dish from the oven. 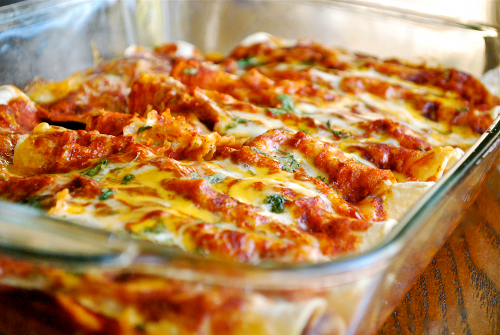 Pour the remaining sauce over the enchiladas and sprinkle remaining cheese over the sauce. Sprinkle with 1 tbsp. fresh cilantro. Lightly cover baking dish with aluminum foil and place into the oven for 20 minutes. Carefully remove foil after 20 minutes and bake, uncovered, for an additional 5-10 minutes or until the cheese is golden. Remove and top with remaining cilantro and a dollop (or two!) of sour cream.